Because there is not enough food for everyone? 1. The fluctuation in food prices is caused by speculation in commodities markets, in addition to real factors such as weather and food production. Regulations can help prevent such severe price increases, and rules have just been passed by the Commodity Futures Trading Commission (given authority in the Dodd-Frank financial overhaul) to do just this. 2. A rise in food prices that may be a minor inconvenience to middle class residents of developed countries means hunger for many in developing nations. They cannot afford price increases, as many of them already spend a majority of their income on food. 3. 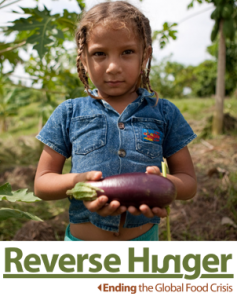 The best way to ensure that hunger is reduced and eventually solved is to provide communities with the resources and tools that they need to grow at least some of their own food. In this way they will be able to provide for themselves, less dependent on imported food, and less affected by price fluctuations in the market. 4. Developed countries like the U.S. play a major part in preventing this from happening. Subsidies, which significantly lower the cost of production for farmers in developed countries, allow nations like the U.S. to dump excess rice, corn, or other crops in developing nations, often under the guise of food aid. While in the short term such food aid is necessary to combat immediate lack of food, such practices can destroy local economies. A prime example is the dumping of free rice in Haiti in the months after the earthquake, making it impossible for Haitian rice farmers to sell their products and harming their livelihood. There are so many more complexities to current food justice and food aid issues, but what gives me some solace is that organizations like the co-sponsors of this event are working to change the system. AJWS has a fantastic petition to Reverse Hunger by maintaining funding for food aid (a fraction of 1% of the national budget) and using those allocations smartly. I am hopeful that we can make an impact and I hope to attend an event in ten years about the progress we have made and how close we are to ending world hunger. Avi Smolen is currently the Communications Manager for Progressive Jewish Alliance & Jewish Funds for Justice, a domestic social justice organization, in New York. He graduated from Rutgers University in 2009 with a BA in Political Science and minor concentrations in Jewish Studies and Psychology. Previously, Avi worked as a Faiths Act Fellow in Washington DC at the Malaria Policy Center, where he focused on engaging college students in multi-faith global health activism, and as Development and Communications Associate in the New York office of Keren Or, a Center in Jerusalem for blind and multi-disabled children and young adults.